Unpaywall is a neat browser extension that will help you find a free version of scientific articles that are otherwise placed behind a paywall. You can add it to Chrome or Firefox, where it searches for Open Access versions of articles for which you would normally need a subscription (or payment). 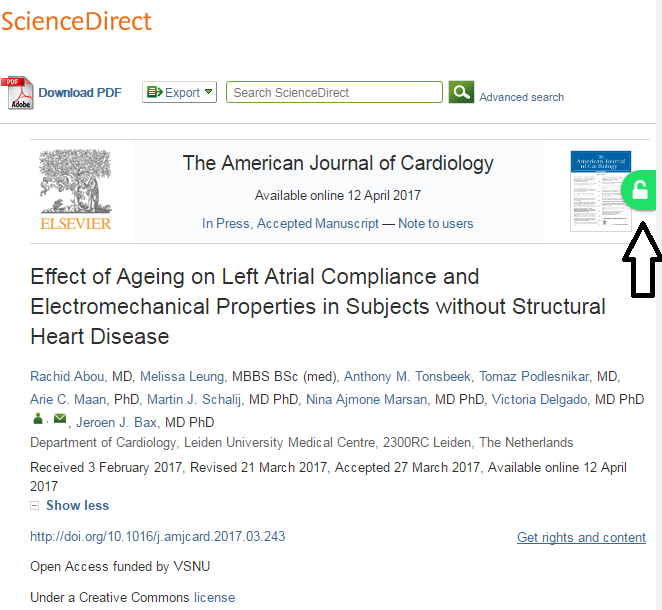 A small icon on the right hand side of your browser indicates the availability of an Open Access file. As Open Access publications are increasing in number, so are the sources in which the can be found. It is hardly feasible to search every possible database for an Open Access version of a publication you want to read. Unpaywall offers a solution by displaying bundled information from among other sources: PubMed Central, DOAJ, Crossref, DataCite, Google Scholar, and many, many open access repositories. From a reader’s point of view: an excellent way for easy off campus reading. From an author’s point of view: an extra encouragement for publishing Open Access as it increases the findability of your work. This entry was posted in Geen categorie by openaccess. Bookmark the permalink.